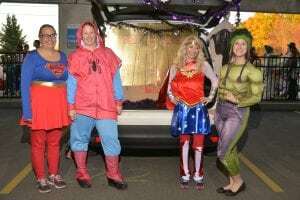 Home » Inside SPHP » Support the 4th Annual Trunk or Treat! On October 26, from 4 to 7 p.m., Samaritan and St. Mary’s hospitals will host the 4th Annual Trunk or Treat. The event, organized by the Healthy Future, Healthy Troy committee, offers a safe place for children to participate in Halloween fun! Children walk around the Samaritan Hospital parking garage and trick-or-treat from the decorated trunks of vehicles. In 2017, candy was handed out to more than 6,000 children and families. The committee needs the help of St. Peter’s Health Partners colleagues to make this year’s event a success for both SPHP and the Troy community. Trunks are a vital part of Trunk or Treat. Gather a group of co-workers or friends and get creative! Decorate a vehicle in a child-appropriate theme, dress in costume, and hand out candy. Running a trunk is not only a way to show support for the community, it is also a great way to have fun with friends and co-workers! All colleagues that decorate a vehicle will be entered in a raffle, and hot food and drinks will be provided. In addition to colleagues, local organizations such as the Boys and Girls Club, Tri-City ValleyCats, YMCA, and Rensselaer Polytechnic Institute participate. If decorating a trunk isn’t your thing, you can still help out by volunteering during the event. Volunteers are needed to help direct lines and traffic, hand out snacks and candy, and other tasks. SPHP staff, their friends, and their children (ages 13 and up), are encouraged to come help out for an hour or more! As a “thank you” for taking part in this huge community event, hot food and drinks will be provided for all. If you are unable to attend Trunk or Treat, but still want to help, you can enter the Healthy Future, Healthy Troy raffles. All proceeds go towards purchasing candy and supplies for Trunk or Treat. The Healthy Future, Healthy Troy committee is raffling off a variety of prize baskets, including a wine basket, movie night basket, Enjoy Troy basket and more! In addition to the baskets, there is also a raffle for a 43 inch Samsung Smart TV! To enter the basket raffles, you can donate a bag of candy or $5. Tickets for the TV raffle cost $2 for 1 ticket, $5 for 3 tickets, or $10 for 13 tickets. Tickets are on sale outside the Samaritan and St. Mary’s hospital cafeterias during lunchtime on Wednesdays, Thursdays, and Fridays each week until October 26. Contact DawnM.Houle@sphp.com for more information. Thank you to everyone who signs up to decorate a trunk and volunteer, or participate in the raffles. 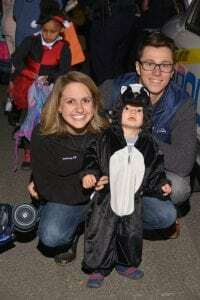 Trunk or Treat would not be possible without the support from St. Peter’s Health Partner’s colleagues!